On the last day of Sukkot, the Jewish holiday lasting seven days that celebrates the harvest, members of the University of Miami community mingled with members of the Miami-Dade Jewish community outside the Hillel Jewish Student Center for a groundbreaking ceremony. 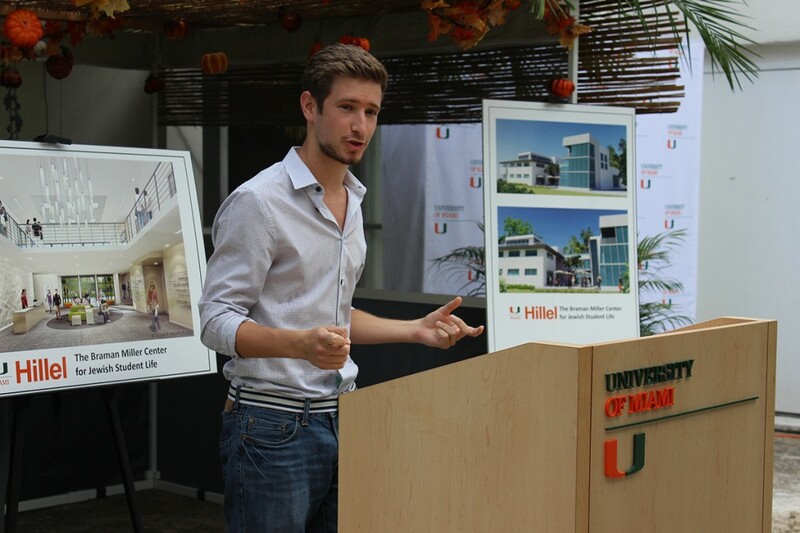 On Wednesday, the UM Hillel program broke ground for its new Braman Miller Center for Jewish Student Life. The new center will be a renovation of the current Student Center at 1100 Stanford Drive, which was first built in 1953. This project was made possible by a leadership gift from the Braman and Miller families of South Florida. UM President Donna E. Shalala, also present at Wednesday’s groundbreaking ceremony, was credited with garnering support from the Florida Board of Trustees and contributing resources from the Momentum2 fundraising campaign. Shalala expressed her wish to continue cultivating a vibrant Jewish student life on campus and giving back to a community that had contributed so much to the university. The capital and endowment campaign was spearheaded by Noreen Gordon Sablotsky, the Chair of the UM Hillel Board of Directors, and was co-chaired by Jeffrey Miller and Debra Wechsler. Over $3.5 million has been raised so far towards an overall goal of $5 million. Miller spoke on Wednesday about the goals of the new student center. The new student center will serve the 2,000 Jewish students on campus as well as their non-Jewish peers. The cafe will offer a dining alternative that can be used by all students. UM Hillel Student Board President Alex Rabhan, now a senior, said that the Hillel community invited him in and helped him find his place. “When I look at all of these plans for the new renovations, I get so jealous because I won’t be here to enjoy it,” he said. Also present at the ceremony Wednesday morning were Vice President for Student Affairs Dr. Patricia Whitely, Senior Vice Provost and Dean of Undergraduate Education Dr. William Green, and former congressman and President of Hillel International Eric Fingerhut. President of the Greater Miami Jewish Federation Jacob Solomon was also invited to speak. In touching upon the recent incident of hate crime against Emory University’s Alpha Epsilon Pi fraternity, Solomon expressed his gratitude towards the UM administration for creating an environment in which all students felt safe, welcomed and supported. The new Braman Miller Center is scheduled to be finished by this time next year by Studio X Architects. It will feature a kosher kitchen, a rooftop patio and new technology fitted for a 21st-century student center. For more information about UM Hillel, visit miamihillel.org.